The names and records that Athing Mu is taking down during her epic season keep getting bigger and bigger. Mu, the remarkable junior who runs for the Trenton Track Club, added to her huge collection of monumental milestones with her biggest record breaking performance yet when she blasted a US#4 all-time 2:03.98 on Saturday to break the NJ 800-meter indoor record that was held by the legendary Ajee' Wilson, one of the biggest names in the sport. Mu's 2:03.98, which is also a new national junior class record (surpassing the former mark of 2:04.96 set in 2007 by Chanelle Price of Easton Pa.) came when she placed fifth at the Camel City Invitational in Winston-Salem, N.C., a race which was won by Wilson in a world indoor flat track record of 1:59.26! Mu has broken several records during her illustrious career, but this one is different. This one was held by Wilson, currently the No. 1 800 meter runner in the U.S. and one of the best in the world! Wilson held the NJ high school indoor record of 2:04.13 since running that time as a senior at Neptune High School at the 2012 Millrose Games at the NY Armory. Wilson, a 2016 U.S. Olympian, is the U.S. outdoor 800m record holder, is a 2-time silver medalist at the World Indoor Championships in the 800m, and she finished third in the 800m at the 2017 World Outdoor Championships. Now that Mu has moved ahead of Wilson on the all-time high school indoor list, the only high school girls to ever run faster than Mu indoors are Sammy Watson of Rush Henrietta in NY ( 2:01.78 in 2017), Mary Decker of Portola in Calif, (2:01.80 in 1974), and Sabrina Southerland of Benjamin Cardozo in NY (2:03.59 in 2013). 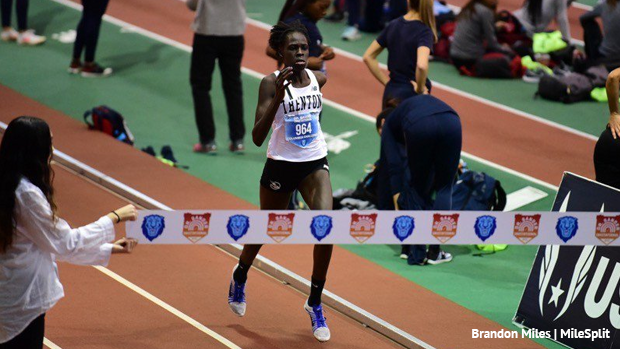 Mu's 2:03.98 adds to her ridiculous list of US #1 times this season as she now owns four US No. 1 times and is in the top five in U.S. history in all four! In addition to the 2:03.98 in the 800, she's also gone a US#3 all-time and NJ record 2:44.43 in the 1K , a US#5 All-Time 52.55 in the 400m, and a US No. 2 All-Time 1:28.54 in the 600m. And on top of that, she's also US No. 10 this season in the 200 with a 24.11. How much faster can Mu go? How much better can her season get? Time will tell, but one thing is for certain - Athing Mu is putting together one of the greatest seasons in U.S. high school history!! !